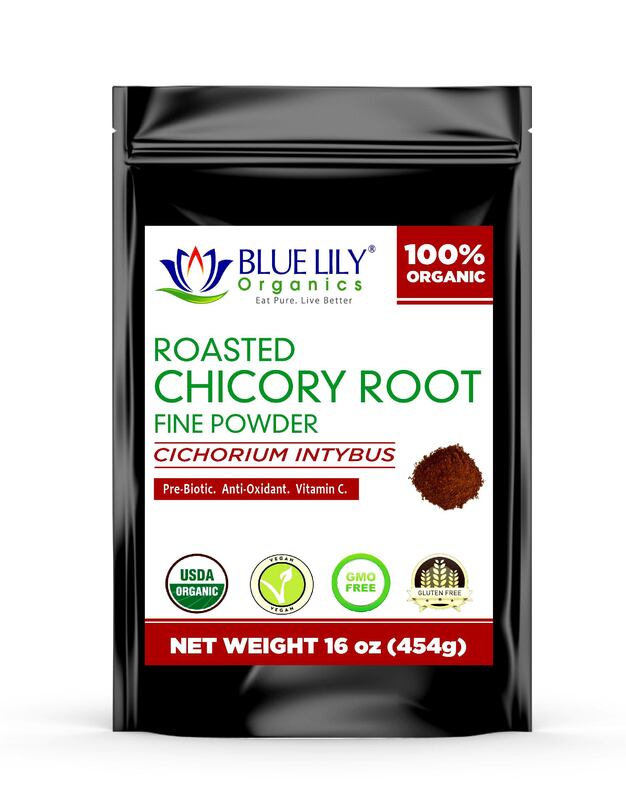 Blue Lily Organics Chicory Root Powder is made with roasting dried chicory roots to a perfect smooth aroma and flavor and grinding the roots into a fine powder. It uses as a substitute for coffee, and it contains no caffeine but an excellent flavor profile. 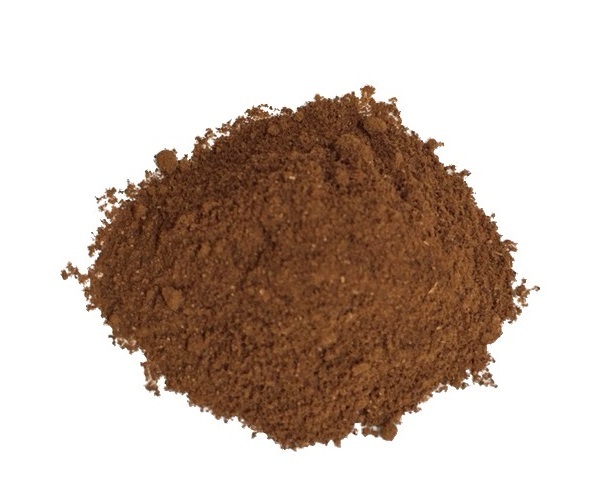 Our chicory root powder is finely ground and is perfect for coffee machines and percolators. It is very rich in inulin a natural soluble fiber, which feeds digestive flora in the intestines and also considers as a pre-biotic. Roasted Chicory has many health benefits, this universally popular herb uses for body cleansing and also can be beneficial for the gallbladder and liver. It has also been known to control blood sugar levels. 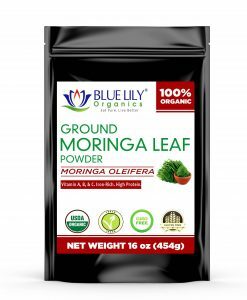 COFFEE ALTERNATIVE: All natural, caffeine free, herbal coffee alternative. Roasted Chicory Root Powder to a rich, smooth flavor. Use it straight or mix with coffee. FIBER RICH INULIN: Chicory Root Powder is rich in Inulin. Inulin is prebiotic. It is a soluble fiber that people cannot digest that stimulates the growth and/or activity of bacteria in the digestive system. 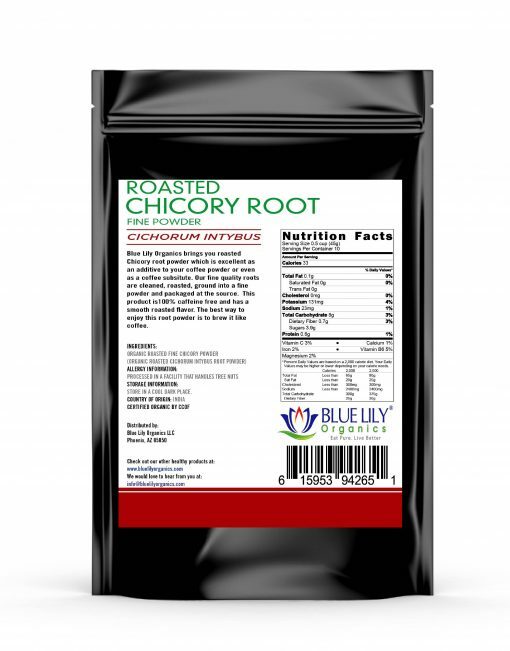 Chicory root Powder also has 64.6% prebiotic fiber by weight. Chicory Root Powder is excellent for digestive health because it contains inulin, a strong probiotic. Prebiotics are a classification of bacteria that confer benefits to the host rather than the disease. Dr Tom Van de Wiele from the University of Ghent, Belgium, wrote in a report published in the Cochrane Library that inulin uses to treat a range of digestive and bowel problems, such as acid reflux. Indigestion and heartburn because it actively reduces the acidity of the body system. Therefore, chicory plays a crucial role in digestion. Chicory increases your immune system. These are vitamins, especially many essential vitamin B groups such as folic acid, pantothenic acid (vitamin B5), pyridoxine (vitamin B6) and thiamine (vitamin B1), niacin (B3). , Chicory leaves are also a good source of calcium. Chicory coffee is a root drink from the chicory plant that has roasted, ground and made into a coffee-like beverage. When added to regular coffee to reduce the total amount of caffeine in coffee drinks. Regular consumption of chicory infusions offers more benefits than regular coffee. Chicory is a flowering plant of the dandelion family, characterizes by a hard, hairy stem, pale lilac flowers, and leaves, which commonly uses in salads. Chicory coffee tastes similar to coffee but has a slightly woody and nutty taste. When alone or mixes with coffee it completes its taste. Mix it with your coffee grind or drink it as an alternative to Coffee.